Well, what an amazing few years! It’s been ages since I have blogged. 15 months and I have begun working part-time, I am a full-time mum and I am a qualified editor and proofreader… one step closer to my dream of being an author!!! I have the monkey off my back… for now anyway! One of my fears as I finished up my Long Service Leave, was that I would simply go back to my old habits. It still concerns me a fair bit, but I have to say, this past week and in particular yesterday morning, has given me a bit more confidence. Overall it was a solid first week… very productive! I feel as if I am back into the swing of things, if not completely on top of everything on the agenda at the moment. I got to the end of the week fairly unscathed and having really enjoyed catching up with my young charges and colleagues once again! The highlight of my week has, by far, been the anticipation and then the meeting of the blogging group of which I am a part. Thanks to Judi… a seasoned gatherer of people, we met and talked about all things blogging – where we are up to, any concerns or questions we have, feedback to each other and a sharing of what we are each enjoying the most about the process. By the sounds of the interest in the group who met, coffee every couple of months may become a regular occurrence! “Threads in the Needle”… completed the much-anticipated quilt… photos will be posted shortly. “Social Graces”… inspiring a number of us to read, think and share concerns. “Early Retirees”… celebrating retirement in style while prompting people to consider things that really matter. “Beach Blogger”… inspiring people to set goals and stick to them – no matter how cold it gets! 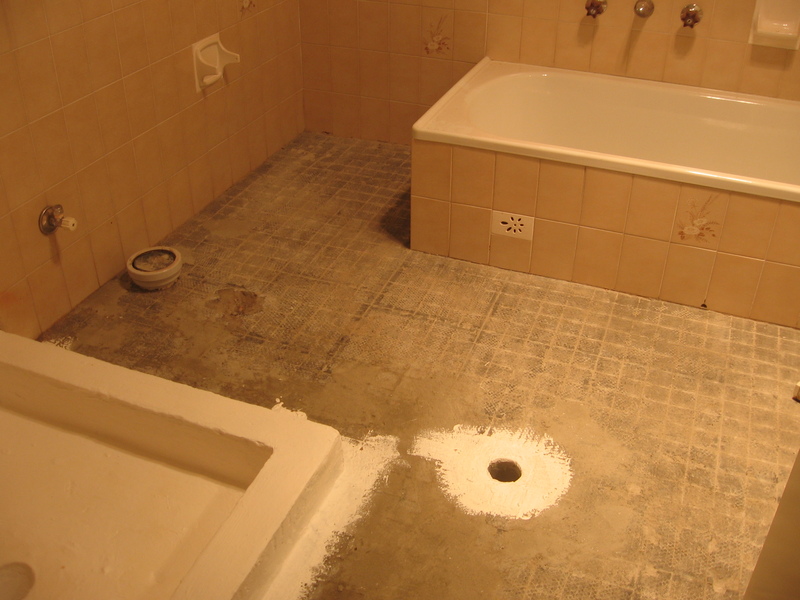 Leslie David… loving his relatively new-found hobby and the medium for sharing his experiences. Eric Stanley… his “Be Happy Be Rich” blog has now been created and he’s preparing for his book launch on Wednesday 23rd June at Berkelouw’s Bookstore, Leichhardt. All are welcome! Helen McNab… using her newfound freedom to write her book and develop her blog. Thanks to a suggestion by Helen, I’d like to open up this post to anyone who came to the gathering or to anyone who couldn’t make it, but who would like to have, join in a post-coffee discussion about the most important things we have learnt about blogging to date. I’ll kick off with one of my ideas, but am looking forward to us creating a list of ideas from this now quite skilled group of bloggers… Thanks to William and a lot of hard work on our part!!! Great conversation, lamb cutlets and berries drizzled with white chocolate… what more could a girl ask for? While I enjoy baking biscuits and desserts, I don’t really consider myself much of a main meal cook. Saturday night, much to my delight, was an exception. Two fellow teacher-friends came over for a catch-up and I spent the afternoon preparing ingredients for the meal so that I could cook it when they arrived. I don’t think I will ever be a Masterchef Australia contender, so my main reason for blogging about this meal is that the girls wanted the recipe. Be aware that it was more appealing to eat than the photo suggests! 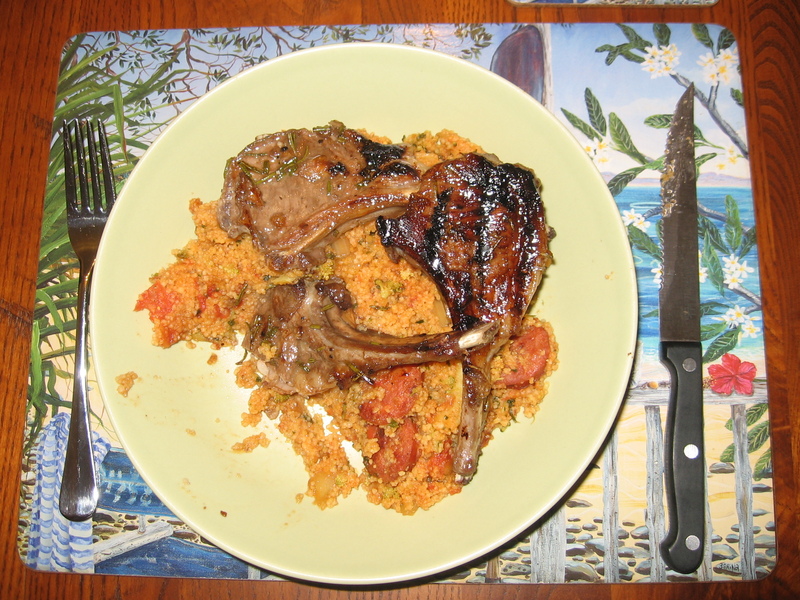 So here goes… after a “healthy” snack of red seedless grapes and crackers with spinach dip we ate our main meal of Rosemary Lamb Cutlets with chorizo and tomato couscous. Preheat a barbeque or char-grill (I used my George Foreman) to medium-high. Combine the rosemary, garlic, anchovies, vinegar, sugar, oil and pepper and brush over the lamb. Cook for 2-3 minutes each side or until cooked to your liking (altered to accommodate the George Foreman). Heat oil in a large frying pan on medium. Cook chorizo for 1-2 min each side, until golden. Remove from pan (rest on paper towels to drain oil – my addition). Cook onion in same pan for 3-5 mins, until soft. Add seasoning mix and stir until fragrant. Add tomatoes, stock and broccoli. Bring to boil and sprinkle over couscous. Reduce heat to low. Cover and simmer for 5 mins, until liquid has been mostly absorbed. Stir through parsley and chorizo using a fork. This meal was really nice. My advice? Three lamb cutlets with the cous cous was too large a meal for the three of us girls – two cutlets would have been plenty. Melt the chocolate, vanilla and cream in a bowl over a saucepan of simmering hot water. When melted, stir to combine. Put berries in three glasses or bowls and drizzle the sauce over the top. Serve with a biscuit such as biscotti (I had baked some chocolate-studded honey biscuits earlier from Donna Hay’s Chocolate Simple Essentials recipe book. I can assure you, the ladies left well-fed and satisfied. I am a 32-year-old fossil! Despite my lifelong interest in Murder She Wrote, Inspector Gadget and Get Smart and as exciting as it would be… I’m NOT a spy, I don’t work for Customs, I don’t have access to intelligence that could threaten Australia’s security if revealed, and my Cluedo skills are disappointing. So why online anonymity and privacy? I reached a milestone today… I realised that you’re meant to register and show your face on Facebook so that others can find you! This “ah ha experience” took a lot of work. In a society where anonymity is a foreign concept and freedom of information is a given… I felt like a fossil trapped in a 32 year old’s body, mostly brought on by the challenge put forward in my ‘Blogging for Beginners’ course to get out there and promote our opinions, ideas and writing. I created a Facebook account last year (feeling very modern and up-to-date), only to realise that the very concept freaked me out. So to fix this, today I decided to upload a photo of myself, not my best angle… my face is a little chubby and I look so rugged up that snowdrifts would suit the background… the waterfall is worth looking at though. From the simple action of uploading a photo there was no stopping me. So I did the unbelievable… I told the world (well the 22 friends I have given permission via my incredibly high privacy settings) that I like to bushwalk, I got engaged last year, my favourite TV show is NCIS and that my hero of all time is Jim Henson. Gasp! Did my world fall in? No! Did a flood of undesirable people come hounding me for my personal details? No! Did I receive advertisements targeted at my updated profile? Yes! Like I needed any more Wedding Advertisements in my life. I DID however get back in touch with a number of Primary School friends, a few I haven’t seen or spoken to for over 20 years. I also learnt how to connect to groups and even decided to go the whole hog and sign up for Twitter. Today, Facebook… tomorrow, ASIO Agent #378!